The social entrepreneurship minor and concentration in Samford University’s Brock School of Business offers classes in the core business disciplines while matching a student's goal of pursuing opportunities in the business and nonprofit world dedicated to helping solving society's social problems. The program is designed to teach a new generation of business leaders the skills necessary to address today's most difficult social problems in their community. Through this program, students are given the opportunity to experience real world business practices in countries outside of the U.S. every other year. 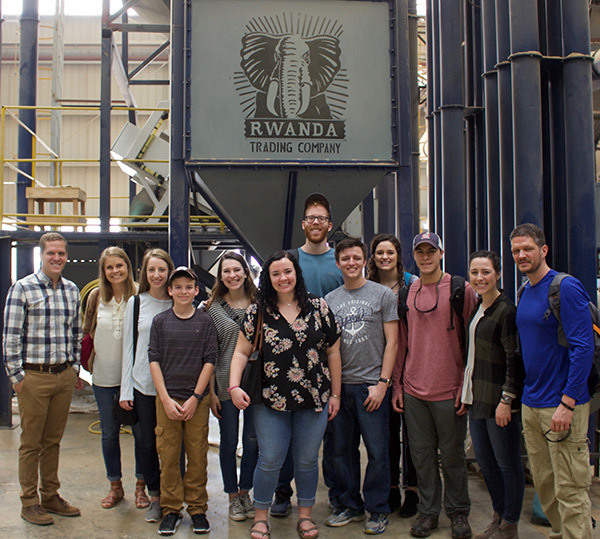 During the 2018 Jan term, eight students traveled with program coordinator and professor of economics Jeremy Thornton and Allison Nanni from Samford’s Mann Center for Ethics and Leadership to explore the business culture of Rwanda, Africa. The purpose of the trip was to learn about the economic growth and business development strategies in Rwanda and how they differ from our own. While in Rwanda, the group visited three to four organizations per day ranging from large non-governmental organizations (NGO) to small, local nonprofits. A few of those visits included three companies that employ Samford alumni. Chase and Rachel Carroll, both Samford business graduates, have been living and working in Rwanda for several years. Chase received his accounting degree in 2013 and works for Karisimbi Partners who seek out U.S. businesses interested in investing in Rwandan companies to help develop the local economy. Rachel, who minored in social entrepreneurship and graduated in 2014, works for a small nonprofit whose mission is to teach women to bake nutritious goods. Another 2017 alumna, Emily Praktish, writes grants for the Anglican Diocese of North Rwanda to help ensure funding for preschool education and nutrition programs in the area. When talking with a few of the student travelers, they shared their favorite moments of this life-changing experience and how they plan to use their individual majors and social entrepreneurship concentration after they graduate.